The Italian Version Of Motor1.com, The Number One Worldwide Automotive Publication, Is Online Now! After a rebranding that began in March, 2017, it is ready to go, 100-percent responsive, with even more content. The Italian version of Motor1.com is online now! The site is based on the OmniAuto.it experience; founded in 2000, it is the go-to for everything automobile, and has Italy’s 1° YouTube car channel. 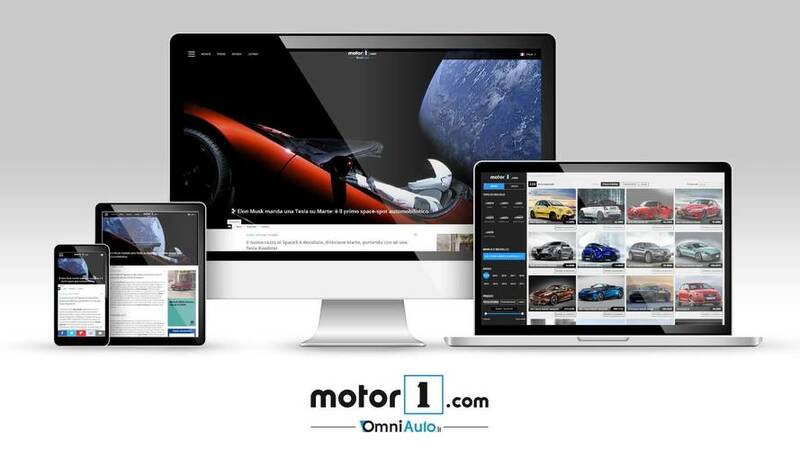 Motor1.com was developed by international web experts, built on a platform already active in 9 countries, ready to continue OmniAuto.it’s reputation for excellent content, one of the aspects that contributed to the site’s growth and success throughout the years. The new site has the latest in digital technology: it is 100% responsive, with a mobile-forward approach, making navigation similar to that of an APP. Users can sign in directly from the browser, and the interface specializes in multimedia content, optimizing viewing of high-definition photos and videos, regardless of what device is being used. The high-quality content is in the hands of a growing editorial staff, actively reporting in Milan and Rome, equipped with a new recording studio dedicated to video production. What’s New: a constantly updated section dedicated to breaking car news, upcoming product launches, and trending concepts. There will be 20 listings providing information concerning every facet of the motor world. Trials: Motor1.com’s backbone is their trial format, consolidated by the success of the #PerchèComprarla review videos (the brand is the largest on the Italian market). There are also Classic Car, daily performance, street trials and special trials formats. Information: the editorial channel dedicated to tutorials and practical information for everyday car use. Pricing: a fully revamped section that makes buying intuitive and fast: the user can integrate a calculation of new car pricing with the editorial content. “Establishing our version of Motor1.com is a cornerstone in the history of our publication and publishing house; we have reached incredible results in 18 years. The global platform allows us to grow without sacrificing the editorial quality that has made OmniAuto.it a touchpoint in the automotive panorama. Our people are the foundation of our strategy, and our journalists and testers are more than reporters; they are key players. This continues thanks to our video content production, with the objective of consolidating our place as Italy’s 1° YouTube automobile channel.” Alessandro Lago, Motor1.com Italia director and OmniAuto.it founder. “When our group joined the Motorsport Network three years ago, they did so with the ambition of becoming the world’s leading online car magazine. Today, we can definitely say that we have done this. We are so proud to be part of this network and to take advantage of an international platform and shared content from the other 8 countries that make it up: America, the U.K., France, Germany, Spain, Hungary, Turkey and Brazil. The creation of the Italian version is an important step in Motor1.com’s international growth.” Filippo Salza, Edimotive’s CEO and President of Motor1.com’s European Operations. “Moving to the new platform is a fundamental technological improvement for us, helping to increase users, especially our Mobile audience. Sales opportunities have increased, thanks to responsive positioning and Sticky Ads that improve format performance and visibility. We are depending heavily on Native Advertising as an optimal solution to increase traffic quality to brand sites, while containing user-experience impact”. Federico Marongiu, Edimotive’s Sales Manager. Edimotive is a partner of the Gruppo Internazionale Motorsport LLC, the only online editor specializing in motorsports, covering principle automotive targets: cars, motorcycles, motorsports and light commercial vehicles. The network includes Motor1.com Italia, Motorsport.com, OmniMoto.it, OmniFurgone.it, and receives over 5.800.000 visits a month.